Towards the middle of the story, readers will see that Papá and daughter are riding on the top of a train. They are refugees, fleeing for their lives, fleeing to El Norte, hitching rides on one of the old, rusted-out trains they call “La Bestia” (“the beast”), but this child does not know any of this. All she knows is that she’s with her papá who loves her, and that’s all that counts. And she counts: “Cuando viajamos” (When we travel), she says, happily riding on Papá’s shoulders, “yo cuento lo que veo” (I count what I see). She sadly counts the hens and chicks, as she says goodbye; she counts the cows, being led away by a new owner; she counts “un burrito aburrido, y cincuenta pájaros en el cielo” (one little bored donkey and fifty birds in the sky), as she and Papá and a coyote watch people load all their belongings on makeshift rafts; she counts the people who live by the train tracks, as they wait for La Bestia to take them to El Norte; and she counts the clouds, which take on the many shapes of a child’s imagination. Throughout, the little girl is all energy and fascination, while Papá watches for danger. The center spread shows the reason for Papá’s fear: Here, border patrol agents have stopped the train and are pulling people out. As they handcuff and arrest some, Papá and daughter and others—accompanied by the coyote—are running for their lives. On almost every double-page spread, readers will see a coyote and sometimes more than one. They are “chuchos” (“mutts”), as Papá calls them. They represent the human smugglers who, for an exorbitant price, accompany the undocumented refugees, sometimes hundreds of miles and sometimes on foot—to reach El Norte. Sometimes coyotes bring the refugees all the way to a safe place and sometimes they abandon them, on their own, often without food or water, in the middle of the desert. The lives of refugees are far from safe and the trip is often deadly dangerous. Yesterday, three youngsters who had a chance to read this book almost dropped it when they realized that the “chuchos” were coyotes. Their father was a refugee from Mexico, and their mother had told them who the “coyotes” are. Young children who are not part of refugee families—and even some who are—may not readily understand all of the symbolism in these illustrations. (The reviewer from Kirkus didn’t, either.) But all Maribel, Amelia, and Anthony needed was a brief explanation from their mother about “symbolism”—and they were off! 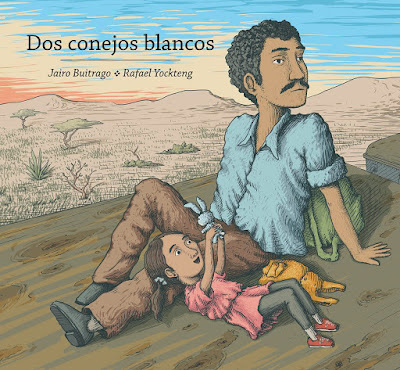 As they read the story and looked carefully at the artwork, the children noticed and were able to answer questions posed by the large details: “Now the papá and daughter look sad. Are they saying goodbye to their hens and chicks? Did they sell their cows to that white guy?” “Why are they talking to the “chucho”? “Where are they going on the rafts?” “Why do all those people live by the train tracks?” “Why are they climbing on the train?” “Why are the papá and daughter and their friends running away?” At first, Maribel had figured it out and explained it to Amelia and Anthony. But very soon, the younger ones “got” the symbolism and effectively explained them to each other. When Papá and daughter stop at a grocery in a small Mexican town to get temporary employment and pay another “chucho” to lead them further, the daughter plays with the store owner’s son; and when it’s time to move on, the youngsters trade: her toy bunny for his two white rabbits, whose home is a cardboard box. In giving up her toy bunny to her new friend, the little girl is trading in her uncertainty for the reality of the two white rabbits, who are going to be free on the other side of the wall. As she and her papá finally cross the border, the child releases the two white rabbits—who on the last double-page spread, with the border wall behind them, scamper off to freedom. In many ways, the two white rabbits, now free, are symbolic of the courage that it takes for this refugee father and his young daughter to cross the desert and risk their lives in order to get to El Norte. Rabbits are survivors; they signify determination. They’re extremely strong and can leap great distances. They can squeeze under fences and—as Maribel, Amelia and Anthony noted—dig underground tunnels. Their sharp vision can detect predators from all directions. They have intimate knowledge of their surroundings and know how to forage for food. Yockteng created the sketches in pencil, which he then scanned and digitally colored and outlined. The result is stunning, with a muted palette of mostly browns, blues and greens that create a sort-of sameness, complementing the story and highlighting the long journey on which all there is for the child to do is to count—and dream. Buitrago and Yockteng have intentionally left the place, which may be Mexico or anywhere in Central America, ambiguous. That’s because, as IBBY Foundation President Patricia Aldana writes in a brief Afterword, “close to a hundred thousand children from Central America make the very dangerous trip you see here to find safety and a way to survive in the United States,” and this small family could represent any of them. Muchísimas gracias a mi amiga y colega, Judy Zalazar Drummond, who introduced me to her grandchildren, Maribel Linda, Amelia Edosia, and Anthony, and to their mom, Melissa—and to the children, for allowing me to see this beautiful story through their eyes.